The Arkansas Support Network (ASN) is a non-profit organization that provides support and services to individuals with disabilities and their families. The organization works with a wide range of government agencies, health care facilities, schools, etc. to provide community based disability services such as supported living and vocational services. 750 employees across the entire state of Arkansas are managed by a centralized, five person human resources department. 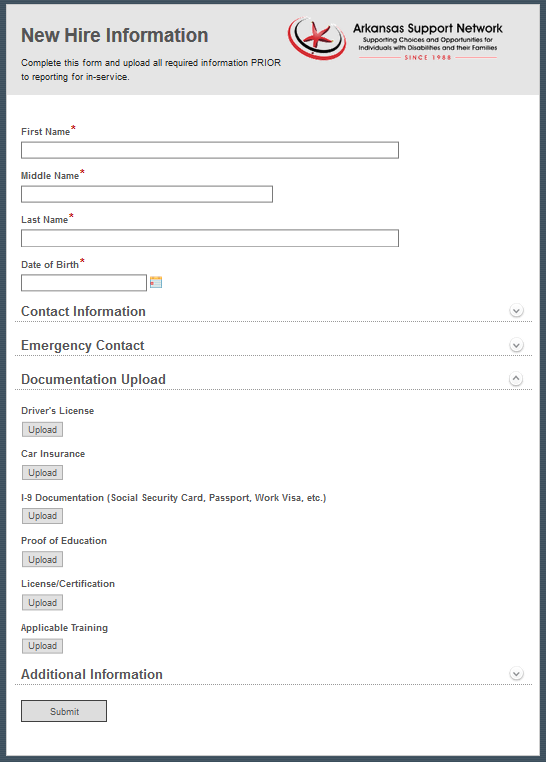 Laserfiche Forms allows the department to streamline hiring and standardize payroll. ASN originally purchased Laserfiche 15 years ago in order to archive hundreds of pages of customer documents and files. Laserfiche was selected as the archiving solution because of its accessibility. ASN’s previous archivist had decreased mobility due to cerebral palsy, so the organization needed a product with an accessible interface. Since then, ASN has added Laserfiche Workflow and most recently Laserfiche Forms, revolutionizing the way the organization runs. “Laserfiche Forms led us to the revelation that the only way you’ll go paperless is if you start paperless.” – Syard Evans, CEO. In the past, employees filled out a paper application form in person at a division office. This application was given to the division manager who reviewed it, interviewed the applicant and set the pay rate. The lack of communication resulted in disparate pay for the same type of work across different divisions. Laserfiche Forms enabled ASN to standardize and transform the entire hiring process, making it completely paperless. Now, applicants apply directly on the ASN website. 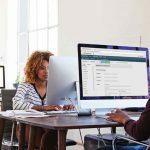 The HR representative reviews applications before they are routed to the division manager, and can reject them if the applicant lacks the basic qualifications, saving time for managers. If approved, the HR representative schedules an interview with the geographically appropriate division manager. He also sets the employee’s proposed pay rate based on education and experience, and starts background and reference checks. The division manager is assigned an electronic form with a list of standard interview questions. 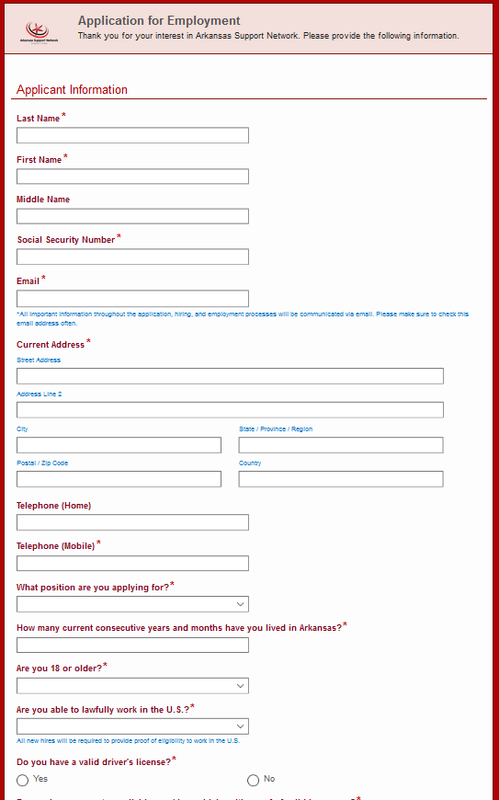 He completes this form during the interview, and has the option of adding more questions as needed. After the interview, the manager can either recommend the applicant for employment or deny him. Once the applicant is recommended for employment, he must meet with a person receiving services and/or their family. They have the final say on whether the applicant should be hired or not. HR inputs notes from the meeting into another electronic form. If the result of the meeting is successful, HR begins the onboarding process. Before his first day, the employee must submit copies of all required documentation via a New Hire Information form. He has the option of uploading copies of all required documentation, such as a driver’s license, car insurance, proof of education, etc. 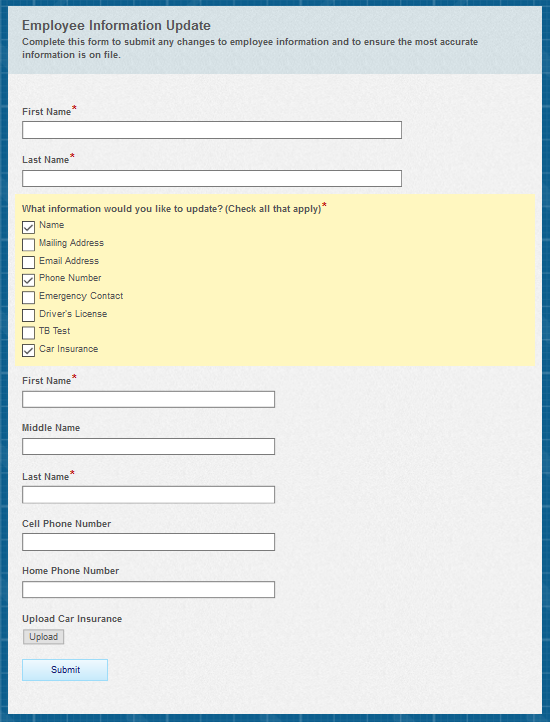 If, at any time, an employee needs to change his personal information, such as an address or car insurance, he can do so through an electronic Employee Information Update form.